Patna: Civil groups have strongly condemned Monday’s police raid at the Jaipur house of eminent social activist and General Secretary of People’s Union For Civil Liberties, Kavita Srivastava. The raid was carried out by Chhattisgarh police in collaboration with the Rajasthan police on the false pretext of hiding some Maoists. “We strongly condemn the raid on the house of Kavita Srivastava, General Secretary of the PUCL by Chhatisgarh police in the early morning of 3 October, 2011 conducted in collaboration with the Jaipur police. They alleged that there was information of some dreaded Maoists hiding in the house of Kavita Srivastava. The raid was done in a completely illegal manner violating the sections of the CRPC related to search. Neither did the raid party have independent persons with it nor did it give the search papers to the members of the family of Kavita as is the norm. We condemn this cavalier attitude of the police,” eminent civil rights activists said in a joint statement on Monday night. Kavita has been consistently speaking and fighting against human rights violations in Chhatisgarh in the name of fighting Maoist militancy. She has been protesting against Salwa Judum and Operation Green Hunt. She has been instrumental in mobilizing support for Binayak Sen. She has also been struggling against the extraordinary laws like the Chhatisgarh Special Public Security Act and AFSPA. Apart from this, she has been vocal on various issues concerning Muslim community also. She condemned and highlighted the highhandedness of Rajasthan police during the Bharatpur riot in which 10 Meo Muslims were killed. She has raised the issue of Bengali speaking Muslims particularly when they were picked, harassed and uprooted after the May 2008 Jaipur serial bombings. 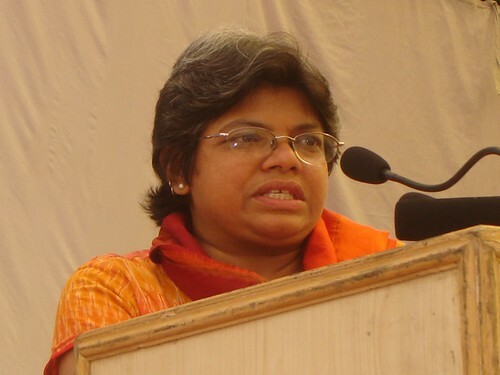 “The police raid on the Jaipur residence of Kavita Srivastava is clearly an act of intimidation by the Chhatisgarh government which has been warning human rights activists that any criticism of Salwa Judum or Green Hunt or any support for those held, tortured or killed in the state operation against Maoists is to be treated as support for the Maoists and would not be tolerated. The government of Chhatisgarh and the central officials have time and again hinted that they treat all kinds of human rights activism as a smoke screen for Maoist activities. The harassment of human right activists is aimed at tiring them out of action, implicating them in false anti-state legal cases thus disabling them,” the activists said. They have demanded an unconditional apology from the Chhatisgarh and Rajasthan governments and asked them to desist from such machinations. Rupesh (Lok Parishad), Arshad Ajmal, Apoorvanand, Ajay Kumar, Vikash Kumar, R. C. Prasad, Vishvajeet Kumar (AISF), Tanveer Akhtar (IPTA), Sudha Vergies (NAWO), Neelu (Bihar Women Network), C.A. Priyadarshi (JSV), Parth Savker, Satish Kumar, Kapileshwar, Father Philip Manthra, Vinay Kantha, Vinay Ohdar.